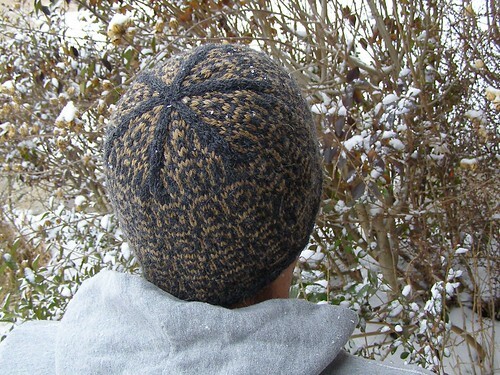 This stranded colorwork hat features an overall circular motif and a rounded top. Please note that the pattern is in chart form. Yarn: Worsted weight wool, 115 yd [105.2 m] main color and 90 yd [82.3 m] contrast color. Needles: Size 5-6 US [3.75-4 mm] 16 in. [40.6 cm] circular and a set of double-pointed needles in the same size, or whatever size you need to get gauge. You may also want to work the brim in a needle size smaller than that used to obtain gauge. Gauge and size: 6 sts and 6.5 rows/in. [2.5 cm] fits approx. adult size 22-23 in. [55.9-58.4 cm] head with final dimensions of 8.5 in. [21.6 cm] tall and 10.5 in. [26.7 cm] wide. For a smaller hat, work at a smaller gauge and/or adjust number of repeats and length of the brim. 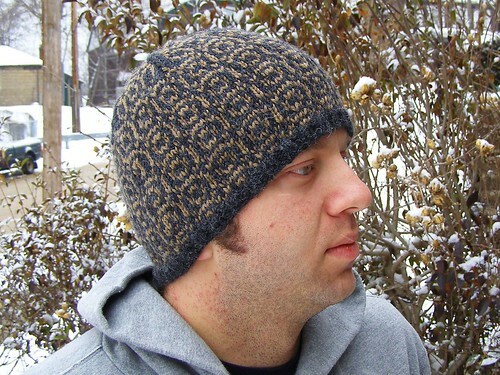 also, snapdragon worsted is perfect for this hat. i’m working on a matchy matchy set of hat and mittens with some of the dark purple and green. you can check out all of the current colors here. because of its semi-solidness, snapdragon looks great with a solid colored commercial yarn.